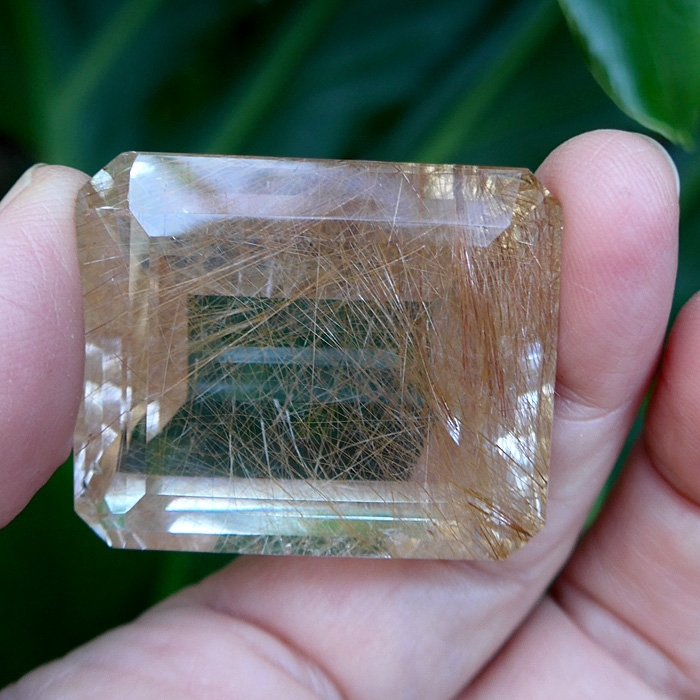 Dimensions (HxWxD): 1.5" x 1.3" x .75"
This 1.5" long Giant Emerald Cut Golden Rutile Gemstone from Brazil, weighing 195 carats, 39 grams or 1.4 ounces, feels like a storehouse of energy! This beauty contains an abundance of thin angel hair golden titanium filaments. This beautiful gemstone also comes complete with its own drawstring pouch. The finish on this beauty is highly reflective, and although this piece is full of inclusions, none of them reach the flawless surface of this eye-catching gemstone with a golden aura. 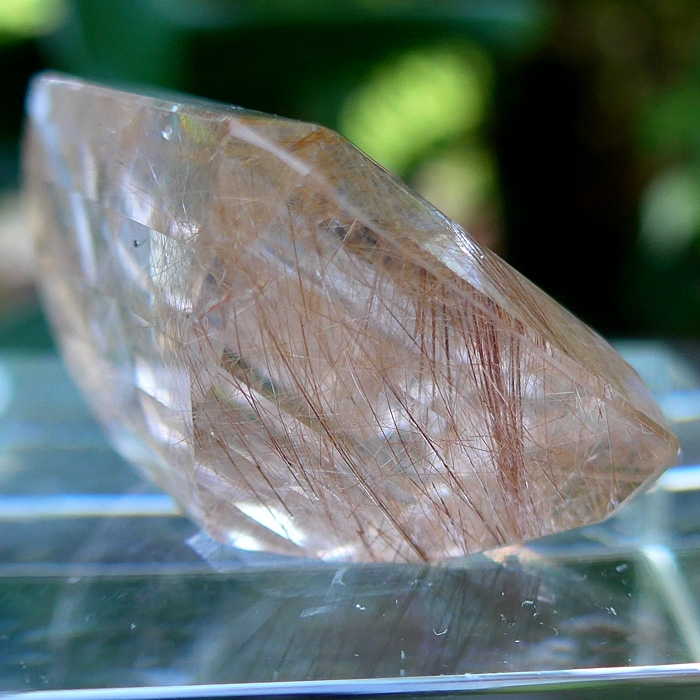 Jane and I discovered the incredible power of highly faceted crystal gemstones for meditation and vibrational healing many years ago, and we'd love to share our very positive experiences with you. 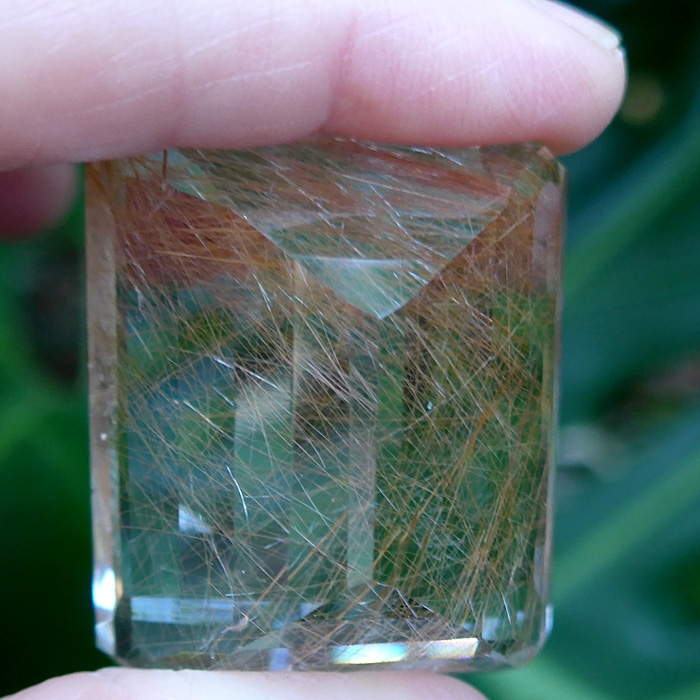 Although natural crystals had always been our favorite, in the early 2000s we began to use Vogel cut crystals in my Reiki healing practice and our interest in faceted crystals led us to experiment with crystal gemstones. The number of facets, the intricacy of the design, the mastery of the cutter the quality of the materials used, and other factors, all contribute to the difficulty of crystal gemstones. The power of polished, highly faceted gemstones for healing and meditation has been documented in the Hindu Vedic and Western alchemical traditions for millennia, and what I have discovered is that there is a special magic to crystal gemstones, just as there is to highly faceted diamonds, rubies, emeralds and sapphires. Try a crystal gemstone in meditation or in energy healing sessions. Hold it in your hand, keep it on your bedside table or altar or computer workstation, and experience the inner fire of crystal gemstones for yourself! 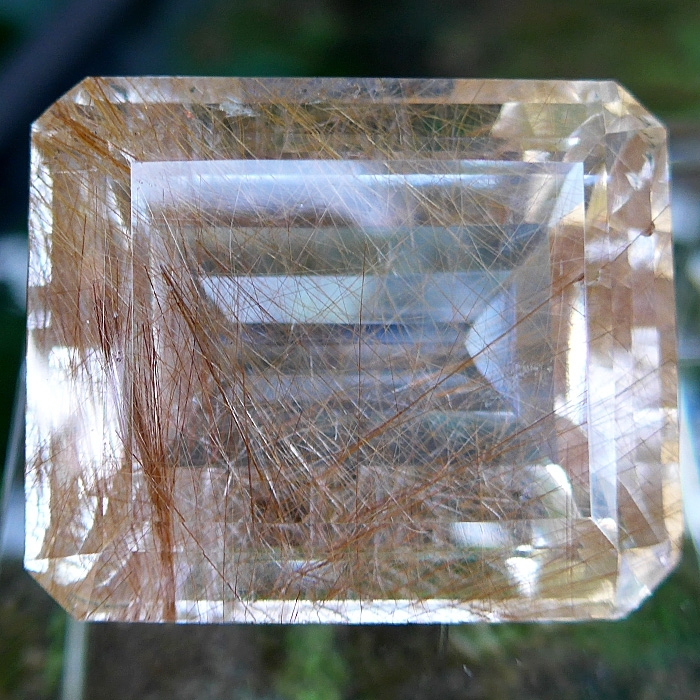 Our experience is that highly faceted crystal gemstones have a powerful energy. Usually crystal gemstones are produced from the highest grade of crystal available and they also are designed to be as luminous and reflective as possible, increasing their ability to receive and transmit Universal Life Force Energy in meditation and healing sessions. 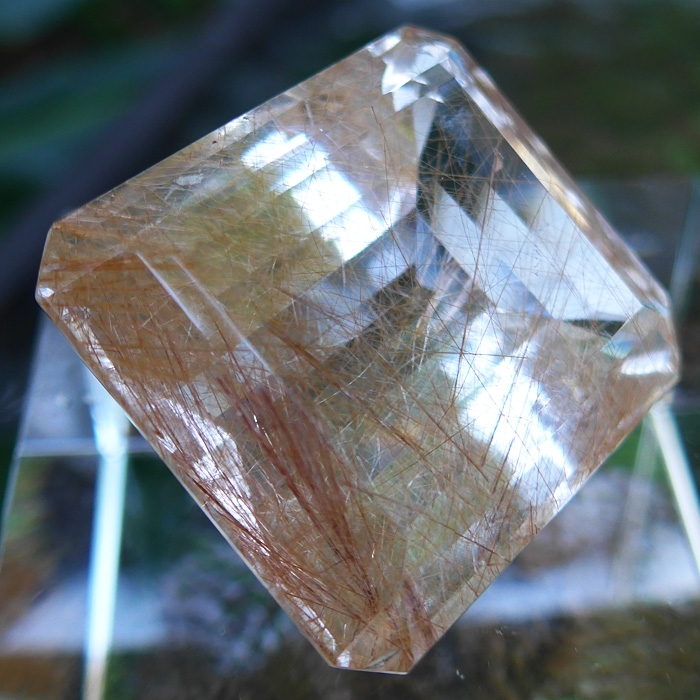 We also found these unusual Rutile Crystals to be very helpful companions in order to restore vitality and gently triggering needed catharsis of negative emotional baggage. Note: Above weight is shipping weight. Actual Weight is 39 grams or 195 carats.